In late 2016 a newspaper article about a Nanaimo school that was building an Indigenous-authored collection of books for the school library caught our eye. The school had a small nucleus of books but wanted to build up their collection with titles that would appeal to all reading levels and that accurately depicted Indigenous history, Canadian history, Indigenous culture. 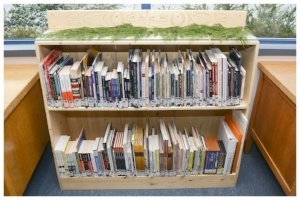 The school, John Barsby Secondary, went a step further and commissioned Snuneymuxw carver Noel Brown to build a bookcase to house the books. School staff put in an application for funding from the Nanaimo school district and the BC Ministry of Education. The collection cost just over $700 and the bookcase just over $1100 so, for under $2000, the school was able to increase its inclusiveness for Indigenous students, and provide reading material that will increase the knowledge and understanding of Indigenous history and culture for students for many years to come. Indigenous authors in Canada are increasingly gaining national attention and winning prestigious literary awards. Introducing all students to books by Indigenous authors creates an awareness of how Indigenous authors are contributing meaningfully to the literary heritage of Canada. For Indigenous youth who aspire to being writers, having access to books written by Indigenous authors can be a pretty powerful inspiration. Reconciliation is like a painting - it is composed of broad expansive strokes and little dashes and dots. We believe that every action towards reconciliation contributes to that painting and should be lauded and celebrated. We were so taken with the actions of the John Barsby School staff that we wanted to contribute to the collection so sent the school a free copy of our book Working Effectively with Aboriginal Peoples®. We did and they sent us one of the nicest thank you cards ever so we decided to extend the offer to other schools. So on that note, if your K-12 school is creating or updating your library with Indigenous-authored books we would be happy to contribute a free copy of our book to your library. This offer is open to the first 50 schools to contact us at info@ictinc.ca. You must have an official school-related email address - no gmail or yahoo addresses please. We hope you enjoyed this article on reconciliation and Indigenous libraries in schools.